How to get there: We describe two routes, obviously, they can also both be travelled in the opposite direction. 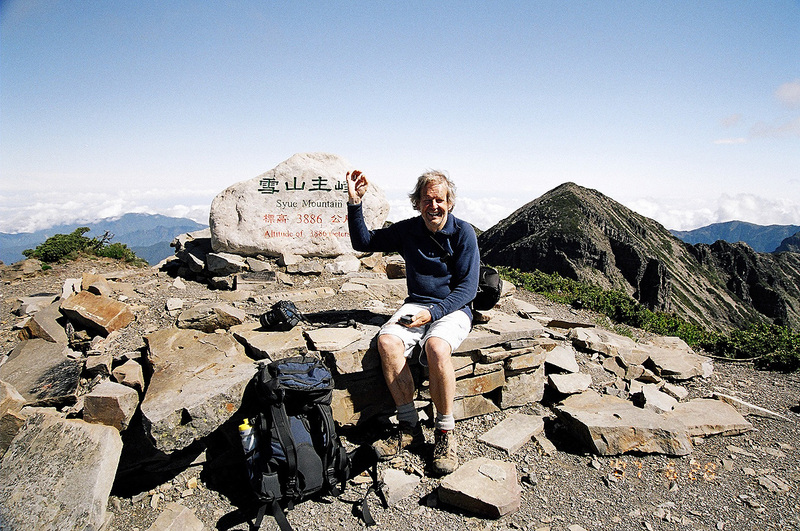 The first route assumes arrival to Taiwan at the Taipei International Airport, the second option that one first went to climb Jade Mountain (the Taiwan HP in the Yu Shan National Park), then proceeded to Syue Mountain. A route from the airport directly to Yu Shan is described under that mountain. A. From the Airport: Drive east on freeway 2 until it connects with freeway 3. Enter freeway 3, direction north, and drive to the next exit. Get off here and enter a rather large city. Follow signs for Hwy. 3 south (This is not the same as the freeway!). You may also follow signs for Hwy. 110 (going east) along this stretch. Exit town on Hwy. 3, going south and continue until you locate the fork where Hwy. 7 (the northenmost branch) exits left. This point is approximately 31 km from the airport. Measure from here. Drive this branch of Hwy. 7 for 14 km where it merges with the southern branch. Continue east along Hwy. 7. This road is narrow and winding, but takes you through quite spectacular landscape with deep valleys and steep, green hillsides. At kilometer 52, the road crosses a deep gorge on a high bridge. There is good parking on your right just before entering the bridge. The road now climbs in rather steep terrain with spectacular views (and drops) on the right hand side. Eventually, you cross the main divide and start a rather long and equally spectacular descent, now with the initial big drops off on your left side. After 88 kilometer, you are finally back down in a new, large valley. Make a 90 degree right turn at the T-shaped intersection and continue south, still on a branch of the Hwy. numbered 7. At km 92, you cross the river on a rather long bridge, make a right turn at the far end in order to remain on Hwy. 7. Hwy. 7 now continues up the valley, first on the left side, later on the right side. The road gradually starts climbing from the valley floor and reaches the small village of Nashan at kilometer 117. This is the last village before the national park. After 15 more km of zig-zag climbing, the road reaches its highest point at kilometer 132. From here, the route descends more gently into a new valley that heads south. At kilometer 141, there are signs for the national park and a side road (bigger than the main Hwy.) forks right in order to enter the park. You will arrive at the Shei-Pa park gate and pay (2007) an entrance fee of NT 180. At kilometer 144, the Hoya Resort Hotel Wuling is located up the hill on your left side. In order to locate the trailhead, continue up the valley 3.5 kilometer as measured from the hotel. The road forks here and there is a sign for the Syue Mountain trailhead. Turn left and head uphill. This road climbs and when it enters a more open area, continue uphill as the road heads somewhat more to the right. A few final switchback turns and you arrive at the small ranger station serving the trailhead. There is parking for about 10 cars right next to the building, while more parking is available a short distance below. The distance from the hotel to this trailhead is about 7.7 kilometer. Measure from the top of the road, this is in Yu Shan National Park, just where the Hwy. 18 ends and Hwy. 21 begins (logically, the road just changes its number from 18 to 21). Drive downhill (north) as the road descends into the deep valley below. This is a pretty impressive change of elevation, the slope of Yu Shan (Jade Mountain) essentially runs from near 4000 meter down to the valley floor. At kilometer 69, stay on Hwy. 21 as this road makes a sharp turn right while the road straight ahead is called Hwy. 16. Later, at kilometer 82, you drive by a nice lake on your right hand side. Bear left as you continue to follow Hwy. 21 as well as signs for the town of Puli. Puli is a rather large town and at kilometer 98/99, look for signs for Hwy.14. Turn right onto Hwy. 14 as you leave Hwy. 21 and continue on Hwy. 14 through town. At kilometer 116, there is a convenient 7/11 store with good parking on your right hand side. The driving time from Yu Shan to this point is about 2.5 hours. Hwy. 14 now climbs considerably as the road climbs a ridge with an increasingly steep drop on the right hand side. The road turns into a mountain road and there may be delays due to the narrow road and the need to meet or pass larger vehicles. Eventually, the road starts descending and at kilometer 166.4 one must turn sharply left (into a tunnel!) in order to now follow Hwy. 8 to the town of Lishan. You reach Lishan at kilometer 195, my driving time to this place was 5:15. Drive through town (downhill) and locate the intersection between Hwy. 8 and Hwy. 7 at kilometer 197. There is a gas station on your right hand side shortly before this point. Make a sharp right turn onto Hwy. 7 and follow this rather narrow road as it initially descends towards the river further below. Continue along Hwy. 7 until kilometer 218. Near this point you should see signs for the National Park and a road that turns sharply left (off Hwy. 7). Follow this road as it backtracks and descends towards the river below. You will arive at a park entry point where they collect (2007) NT 180 as an entrance fee. At kilometer 221, you will approach a pretty fancy hotel (the Hoya Resort Hotel Wuling) on your left. Route description: From the trailhead, the route leaves the small platform in front of the ranger station and turns uphill. The first kilmometer is characterized by a zig-zag path, often having gentle stone steps, that climbs the first part of the ridge above. The trail is marked with a distance marker every 100 meter, certainly a frequent update. After about one kilometer, the climb is more gentle as the trail continues with a mix of flat and uphill sections reaching a first (unmanned) hut approximately at kilometer two. Note that the trail makes a right turn here just before the building. From here and until kilometer 4, the trail again zig-zags uphill, gaining considerable elevation before getting to the first local point on the ridge at about 3120 meter and location N24:23.433, E121:16.674. The nice trail now continues near by a local hill called the East Summit (the trail forks with the left route climbing it). However, this point is really not a summit, as its prominence is very low indeed. You pass a marked helicopter landing spot just as the two trails again merge, then continue along the ridge as it continues toward the west where you now may see the Syue mountain further back. The trail eventually traverses right and leaves the ridge, descending slightly to the lodge called "369". This name is appearently derived from its nearby mountain (uphill slightly south of west) with elevation 3666, an earlier estimate may have been 3690. Many local climbers use this lodge when doing this trip as a multi-day hike, however, it did not seem to have any form of permanent staff. Continuing further beyond the hut, one arrives at a trail fork (signs only in Chinese! ), the left fork heads uphill and is the proper trail to Syue Mountain. The right fork traverses more across and leads to a col on the Holy Ridge, a ridge that runs from the summit of Syue towards the north and all the way to a famous peak, Dabajian (3492m) about 15 kilometer further to the north. After climbing the open fields above the 369 hut, the trail enters a forest area with rather large trees. Higher up, you emerge from the forest more or less directly into a nice basin, just north-east of the summit. 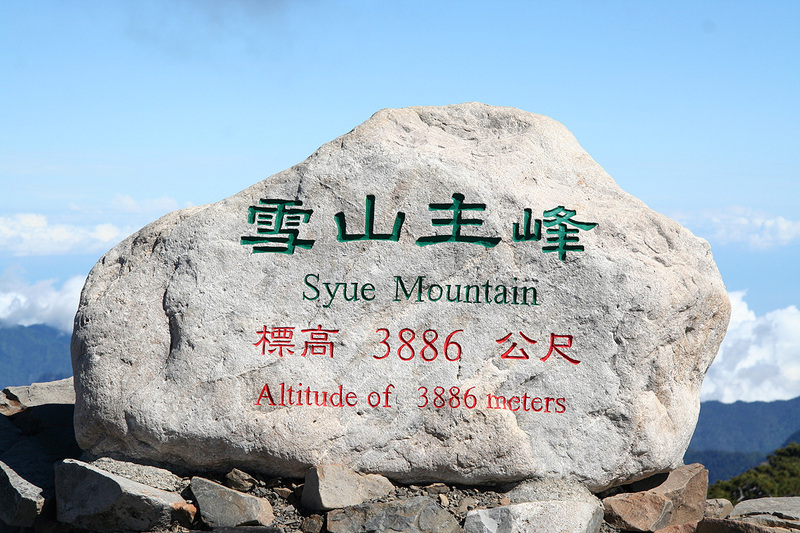 The slightly lower (3880 m) peak to the north of Syue mountain may look just as high from this viewpoint. The nice, (YDS) class 1 trail continues uphill a bit towards your left before making a final, gentle traverse to the summit point. Comments: I climbed this mountain solo. Starting out with the first daylight at 0435, it took me 2:30 to reach the 369 Lodge at 0705. I had a nice 10 minute break here before heading up to the summit, arriving at 0855. Unlike Jade Mountain, I had blue sky and very descent conditions for some panorama photos. The nearby subsidiary summit with an elevation of 3880 meter looked interesting and I took time to study the map in order to look for alternative ways for my return hike. The day was still early, it would be a shame to descend from this area before exploring more. I thus set out to explore the first part of "The Holy Ridge", aiming for the Syue North Peak. This project turned out to be somewhat longer than estimated, I finally returned to my car after approximately 11.5 hours of hiking. Syue Mountain is, besides Jade Mountain in the Yu Shan National Park, one of the two Ultra Prominent mountains on the island of Taiwan. Me on the summit. This photo was taken by another hiker that I met. Later, this photo was mailed to me by Doris, the person that helped me with the permit issues. Summit Panorama I, the view is north. The "Holy Ridge" stretching 15 kilometer to the characteristic (steep) peak Dabajian. Summit Panorama II, the view is continues east. Summit Panorama III, the view is continues south. Summit Panorama IV, the view is continues south to west. Summit Panorama V, the view is continues west. Summit Panorama VI, the view is continues west to north. Summit Panorama VII, the view is north. A map of the route. 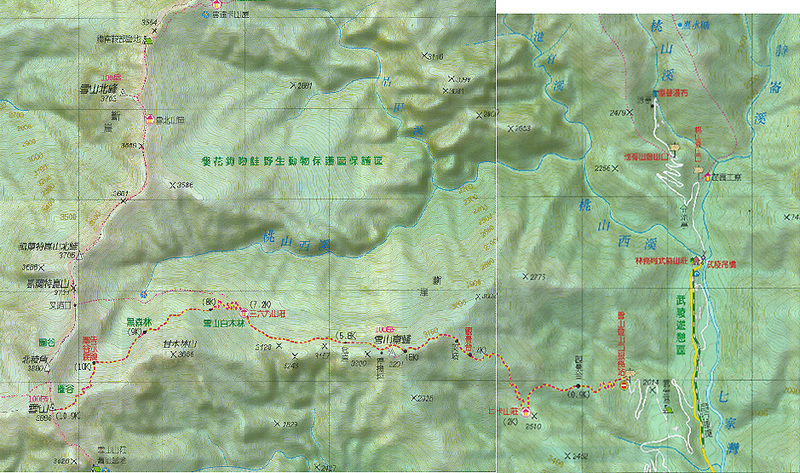 The main trail to Syue mountain as well as the trail on The Holy Ridge to the North Summit and the shortcut back to the 369 Lodge are shown.